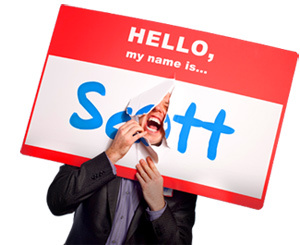 So, You've Been Put in Charge of the Nametags - HELLO, my name is Scott! There’s only a few weeks left until the big meeting. Thus far, your preparations have run smoothly: almost all of your attendees are registered, the flowers are ordered, the band is booked, and the room design is perfect. All you need to do now is make sure your attendees know each other! So, now it’s time to prepare those stinkin’ nametags. Although preparation of your attendees’ nametags is usually the last thing on your to-do list, it doesn’t mean it’s the least important. There are several important nametag issues to consider that will assure the comfort and approachability of your attendees. Ask yourself the following questions, and you will be able to effectively manage your nametag creation and distribution. Decide on nametag and holder style that will best accommodate your members’ wardrobes, i.e., adhesive, magnet, clip, lanyard. To see some of the most common nametags and holder styles, go to PC/Nametag. What information will be printed on the nametag? Other than their name, include the job title, company and hometown. This is a great way to expedite networking and break the ice. If you have a varied audience with exhibitors, speakers, buyers, spouses, suppliers, managers, etc., consider some type of designation, either on the nametag itself or as a stackable ribbon. To learn about different types of designators, go to PC/Nametag. Is anonymity an issue with some attendees? For singles, youth, support or health groups it will be wise to limit the amount of information that appears on the nametags for safety and emotional considerations. From whom will you purchase or print your attendees’ nametags? For the best quality adhesive nametags, go to MACO. For the most incredible custom engravings, go to Incredible Engravings. And for all of your connector, lanyard and badge holder needs, go to PC/Nametag. Where will your attendees pick up their nametags? You will need to section off part of your registration area specifically for your attendees’ nametags. The display of the nametags is up to you, but I recommend some of these organizers for maximum accessibility. 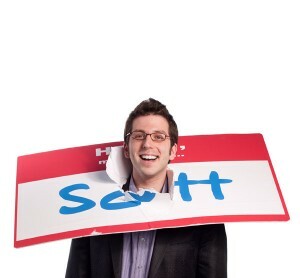 What if your attendees bring their own nametags? For Chambers of Commerce or other networking groups, some people prefer to bring their own custom nametags. Don’t be offended if they want to wear their own nametag. Hey, at least they wear a nametag! What is the function of their nametags? If your attendees’ nametags have more than one function, i.e., meal tickets, security or table information, be sure to include that in your when you order and/or create the nametag. What if someone registers late or doesn’t have a nametag? Bring a portable printer, extra nametags, additional lanyards, Sharpies, badge holders and clips. It’s always good to be prepared. Also, if a last-minute attendee needs a nametag, don’t give them a second-rate ‘orphan-tag’ that looks nothing like the others. They’re already embarrassed enough! REMEMBER: Nametags aren’t everyone’s favorite part of the meeting, but if they are not created and distributed effectively, frustration will arise. And it will reflect poorly on you as the meeting planner. So consider these nametag issues and you will ease the burden of name forgetting, starting conversations and networking. And go the extra mile! Why? So your attendees won’t have to! What’s the worst nametag you’ve ever seen?